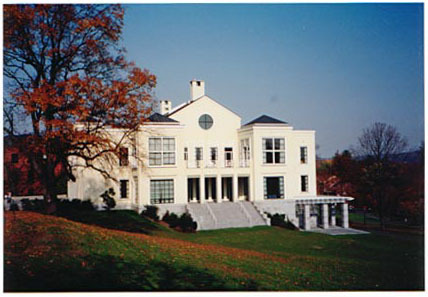 The Keefe Campus Center was finished in the fall of 1987 as part of the plan to dismantle the fraternity system at Amherst. It was designed Perry, Dean, Rogers, and Partners, and houses a small performance space, offices, meeting rooms, a snack bar, and student mailboxes. In more recent days, the school store was replaced by a game room, and both WAMH 89.3 fm and The Amherst Student, the College's weekly paper, moved into the building (Photo taken 12 October 2001). 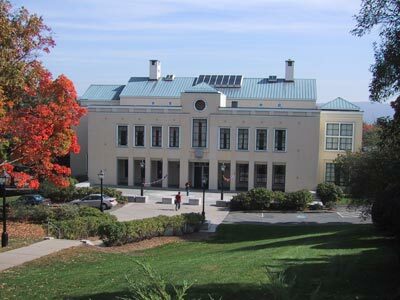 The design of the Campus Center contains elements of a number of other buildings on campus, from the yellow exterior of the Octagon to the "neo-classical exterior with rectilinear arcades to match Fayerweather's arches" (Amherst Student, May 3, 1986). In 2000, the building was dedicated to Harry Keefe '43. (Photo taken October 1991). In a letter now kept in the Amherst Archives & Special Collections, President Pouncey wrote on January 28, 1985 that Fayerweather should be left to the Fine Arts Department, and decided "to build a free-standing Campus Center, east of Mead but close to Eden, on a site that had always been earmarked for a major building" (A & SC, Buildings and Grounds Collection, box 2, folder 55).